If you’ve never made fish cakes, I hope today’s blog post pushes you to make some this week. They’re so simple to make, come together quickly, and are the perfect thing to have in your freezer for quick meals. 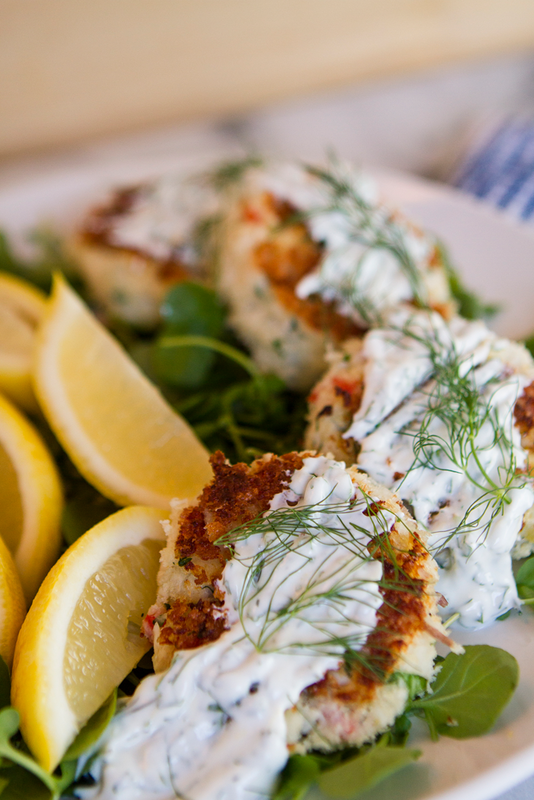 These Barramundi Fish Cakes will hopefully make an appearance on your dinner menu soon enough! Being an islander, both from birth (Dominican Republic) and from where I am currently located (Martha’s Vineyard), seafood has always played a big part of my meals. Whether it was fried fish with a squeeze of lime and a side of plantains on the sandy beaches of the Dominican Republic or a bowl of clam chowder on the ferry boat to Martha’s Vineyard, it has its way of creeping up on me. It’s what I love ordering on restaurant menus, since it feels indulgent enough, but easy enough to whip up at home. When The Better Fish a.k.a. Australis Barramundi folks messaged me on Instagram offering me to give barramundi a try, I was instantly intrigued. Because barramundi was a fish I had yet to try! Hailing all the way from Australia (a country that’s still on my travel bucket list as one of my closest friends resides there), it seems that barramundi has been taking the world by storm with its many positive qualities. Fish cakes were the first thing to come to mind after I received my shipment of the most gorgeous barramundi ever. Why fish cakes? Well, because they are always packed with tons of flavor in every bite, are easily adaptable, and are perfect for freezing for future meals. Also, I just love that you can do so many things with them: serve them atop a salad, tuck them between a soft buttered bun, make them into minis for a passed appetizer, or as the main protein with a side of grilled vegetables, rice, or whole grains. The possibilities are endless with fish cakes! If you’re gluten free – just substitute the breadcrumbs with gluten free crumbs and you’re ready to enjoy them. The clean, buttery taste of barramundi, combined with the fact that it tastes like a cross between grouper and halibut, are just some of the reasons you’ll love it in my opinion. Make these fish cakes and you’ll understand why I love them so much and always have them at hand for quick meals! Preheat your oven to 350 and place unseasoned fish on baking tray. Bake for 12 minutes, until opaque. Remove from pan and chill for 10 minute in refrigerator. In a large bowl, mash the baked potato and flake the chilled cooked fish into it. Add the rest of the ingredients and combine until a mixture forms. To form patties, use a ⅓ cup measure to scoop and form or use hands to shape into discs. Coat with panko and refrigerate for an hour before frying. In the meantime, preheat oven again to 350F and in a large saucepan, heat ½ inch vegetable oil. Fry the cakes on each side until golden brown (3 minutes each) and then bake until heated through. To make sauce: whisk all ingredients together. Serve with sauce, greens, and extra lemon wedges. Disclaimer: Thanks to The Better Fish for providing me with barramundi to taste at home. I was under no obligation to develop a recipe or share it with my audience, but I loved it so much I had to. Opinions, as always, are 100% my own.